Apogaea Effigy and Temple grant rounds open as of September 15! 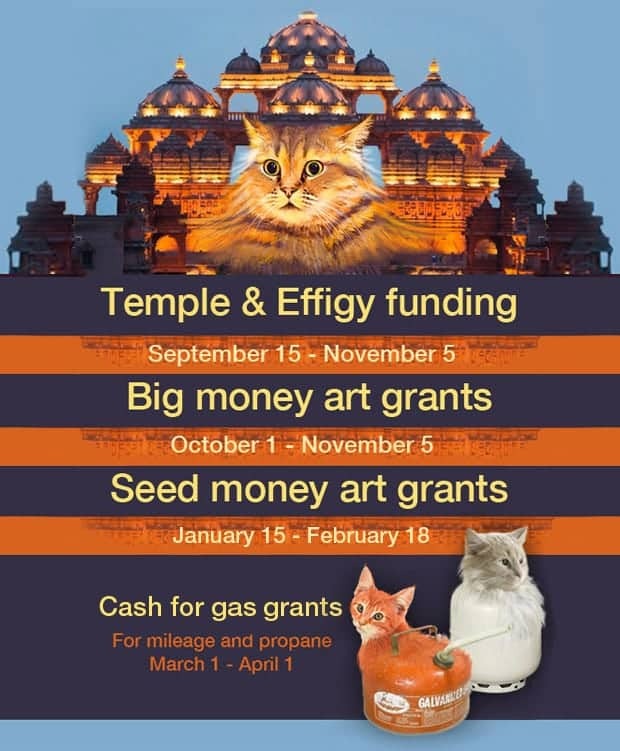 The grant round for Effigy and Temple is open Saturday, September 15 through Monday, November 5! We here at CATS are looking forward to seeing your ideas for these defining centerpieces of Apogaean art. This grant round funds requests between $600 and $6,000. You may request funding for propane and transportation as part of this grant or request additional funding for these during the new grant round, Cash for GAS, which opens in March. See descriptions of past effigy [https://apogaea.com/effigy/] and temple [https://apogaea.com/temple/] projects for inspiration. Please reach out to [email protected] if you have any questions. 2018 CATS End Of Year Report Available!